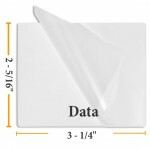 Data (IBM) Size Laminating Pouches measure 2 5/16" x 3 1/4" (59mm x 83mm). Available Thicknesses: 5 Mil 7 Mil or 10 Mil. 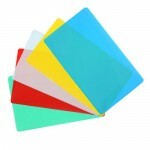 Available in Clear Gloss and Sticky Back Laminating Pouches for use in thermal pouch laminator machines.